Above 49: Time to Get Spanked! You can get the XBLA version here and the PSN game page is here (unfortunately, you can only get the PSN version directly on your PS3, boo!). It's 1200 points and $14.99 USD respectively. In terms of PPUH (price per unit of hilarity), you won't find a cheaper source of mirth, I guarantee it. After spending over a year and a half on this project, it's fantastic for folks to finally get a chance to play it. Additionally, this is my 100th blog post! An auspicious anniversary indeed. Thank you to anyone that has read, commented and otherwise inspired me to keep writing along the way. Participating in this community has enabled me to meet some fantastic people who continually engage me with their writing. I could not be more appreciative. And of course, thanks to my wonderful wife who so kindly edits every damn one of these things. They would be far less coherent without her efforts. Thanks everyone! Now that's enough of my blabbing, go play the game I made! Looking forward to try it. Have just finished the special edition of Monkey Island 2, and I must say that I really enjoyed the humour in it. I also like the more Diablo-esque kind of games, so I will definitely try DeathSpank out when I get some more time (playing Demon's Souls right now). Congratulation with your game and your blog. @Gustav Thanks! There's definitely a lot of Monkey Island ton in DeathSpank, hopefully you'll enjoy it. It's definitely a counterpoint for the relentless brutality of Demon's Souls, so maybe it well be even more enjoyable in contrast. Congratulations on an exceptional game. I hope there's some DLC or a sequel on the way. @juv3nal Tell all your friends to buy a copy and we'll see what we can do! ;) Seriously though, we would probably have a hard time keep a guy like DeathSpank quiet for too long. 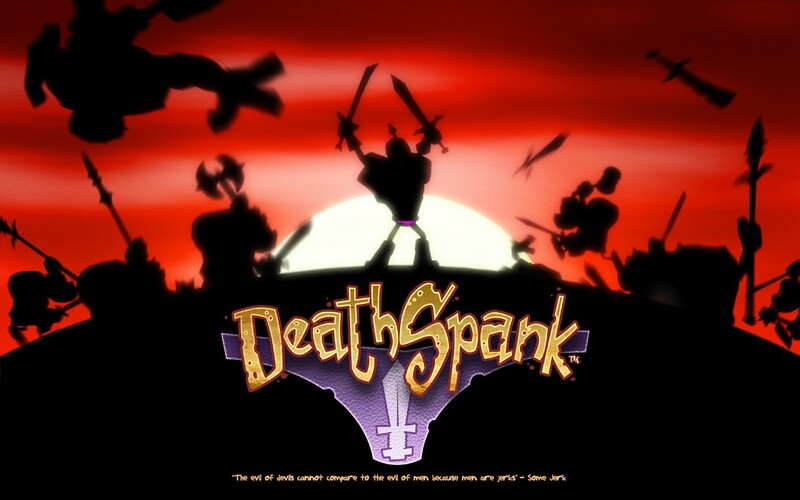 Deathspank is certainly one of the most enjoyable games I've played this year so far. A decent, well made RPG which doesn't take itself too seriously is hard to come by, the Humour is spot on also. I really hope so see some DLC that'd be awesome. @Alcoholica87 Thanks! We've definitely got some big things in the works and I don't think it will even be too long before we start talking about them.